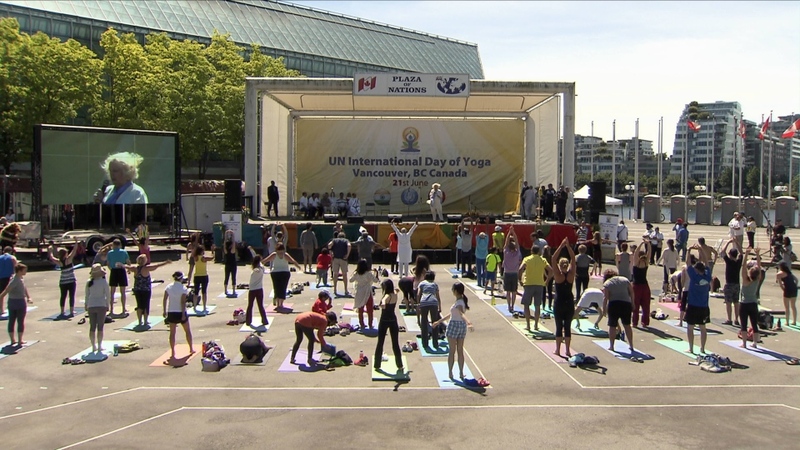 Sunday was both International Yoga Day and National Aboriginal Day, and multiple events in Vancouver aimed to bring the two together. The controversial “Om the Bridge” event that would have shut down the Burrard Bridge for seven hours for a yoga class was cancelled, and a smaller event was held at the Plaza of Nations on Pacific Boulevard. Hereditary Chief Phil Lane Jr. of the U.S.-based Chickasaw Nation was an invited guest at the Plaza of Nations event. He said the two celebrations -- International Yoga Day and National Aboriginal Day -- have a lot in common. “Today is a global event in which many, many members of the human family everywhere are expressing their love and prayer and meditation and good feelings about unity,” he said. Elsewhere in Vancouver, Moksha Yoga Burnaby was among the groups hosting a sit-in on the Stanley Park seawall to support First Nations that have mounted legal challenges against the Enbridge Northern Gateway pipeline. Organizer Jesse Hodsman says with all the negative press 'Om the Bridge' -- which Premier Christy Clark announced earlier in the month -- got, the group is grateful to be hosting an alternative event.